A health visitor’s drive to improve parents’ understanding of the vital importance of movement and interaction from birth has been transforming the readiness of thousands of Kent children for school. 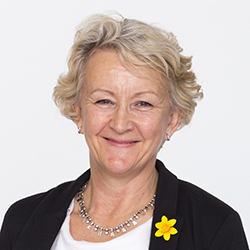 Julia Haynes devised and delivered Born to Move across the county, a project that has seen thousands of front-line staff trained to benefit more than 90,000 children. Ms Haynes could see a cultural shift meant infants’ lives were increasingly sedentary. ‘Increasing numbers of children were not developmentally ready by school-age to reach their full potential,’ she says. Information from primary school entry classes indicated that 80% of children starting school in September 2010 had speech and language delay and developmental delay affecting on school readiness. Ms Haynes secured funding through the District Early Years Advisory Board for a pilot in one district from 2010-2012, training all front-line staff in health visiting and children centres. ‘They needed to be up to date on neuroscience and trained to educate all parents and carers with a consistent message, empowering them with new skills to support more children to reach expected milestones in the first year,’ she says. ‘Crucially we empowered front-line staff to give parents the ‘why’ – because it will help you improve your child’s start at school. Over three years these trainers have cascaded the workshops to over 3,000 staff. As well as a Born to Move leaflet for parents, Ms Hayes designed and implemented a page for the Red Book – ensuring it was integrated into the five universal health visitor and children centre contacts. She also developed a free app which includes crucial messages from birth to age five years. The biggest change, says Ms Haynes, has been for practitioners and the way in which they deliver services to families. ‘The multi-agency workshops have strengthened front-line practice – our joint aims and a consistent, pro-active message is given to all 19,000 births in Kent each year. Ms Herron says Ms Haynes has been a driving force for innovation and quality improvement in the health visitor team. ‘Julia is passionate about making a difference to the outcomes for children. ‘It was clear at an early stage that the Born to Move project has an impact, and Julia has shown a commitment and determination to share her work. Ms Melville is one of the champions. She has delivered the ‘enjoyable, relevant and motivational’ training to around 40 colleagues. ‘They feedback that this is “real health visiting”. It has a continued impact on their practice and can be used in every contact with parents to promote their child's development. 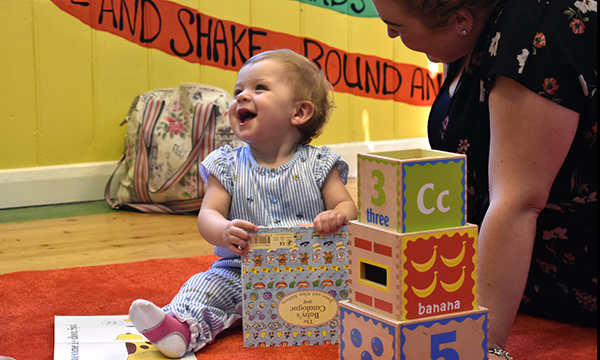 ‘The combined approach promotes infant and child development through awake tummy time, increased movement and activity levels and an emphasis on valuing sustained communication between parent and child. ‘I've been privileged to witness the effects. More babies appear to be strong and progressing quickly in their development. I am also more aware of the babies who are not developing quite as fast. 'My increased level of knowledge around 'normal' physiological and cognitive development has enabled me to promote development for older children where there appears to be possible developmental issues or delay in acquiring independent skills.' Ms Haynes has recently retired but her ambition to see Born to Move rolled out throughout the country remains strong because of its potential to improve the lives of a generation. Child health clinics have been transformed into interactive baby hubs. Parents are not allowed to bring in car seats, meaning the babies are able to move around on the floor and interact. ‘We encourage parents to make friends and talk. Before everyone was in their own little bubble,’ says Ms Haynes. An important message, she adds, is that ‘chatter matters’ to prevent speech and language delay at school entry. The best way to learn to talk is by being spoken to daily from the start. 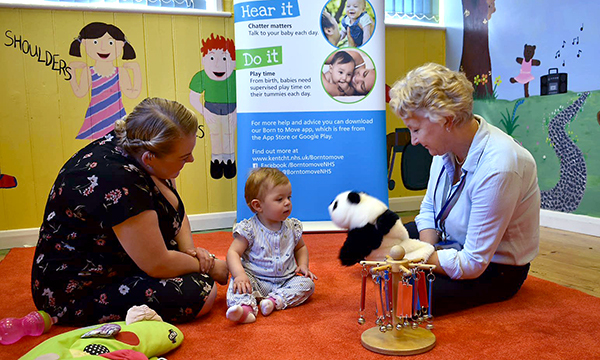 Another is ‘eyes need to move too' with health visitors encouraging more 1:1 interaction between parents and infants and minimal screen time for under-3s to encourage healthy eye muscle and eye tracking development for reading later. The biggest achievement, she feels, is the measurement of Born to Move’s impact through a county-wide audit of one-year universal developmental reviews and the number of babies achieving expected levels development. In 2015 and 2016 all checks done in a calendar month were reviewed and the data of 670 babies analysed. ‘It showed a vast improvement in the number of babies crawling in the first year,’ says Ms Haynes. ‘At the start of the project only 30% of babies were being offered any awake tummy time in their first year and this was leading to developmental delay in achieving expected milestones. Feedback from parents and front-line staff has been so positive that she is determined to share their messages more widely. ‘I’m on a mission as this is so important – babies need to move and parents need to know it,’ she says. ‘This cost-effective early intervention is achieved through the workforce using existing contacts but brings positive possible long-term outcomes in children’s lives. Children are developing positive attitudes towards physical activity, and have improved concentration, coordination and spatial awareness. ‘Parents and carers have improved understanding of their fundamental role in the developmental success of the child and early years staff are empowered with practical skills to encourage children to reach their potential rather than assuming development will just happen. Julia Haynes was shortlisted for the 2018 RCNi Community Nursing Award, sponsored by Superdrug.